In 10-inch skillet, cook beef over medium-high heat 5 to 7 minutes, stirring occasionally, until thoroughly cooked; drain. Stir in hot water, uncooked pasta and sauce mix (from Hamburger Helper box), chili powder, oregano, pepper sauce and garlic. Heat to boiling, stirring occasionally. Reduce heat; cover and simmer 5 minutes, stirring occasionally. Uncover and cook 5 minutes longer. Remove from heat; cool 5 minutes. Serve beef mixture on lettuce leaves. Sprinkle with tomato; top with dollop of sour cream. 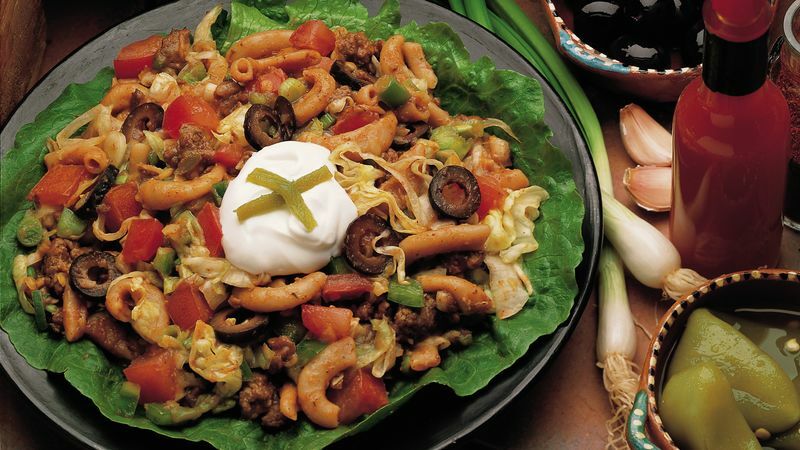 Serve the beef mixture on a bed of tortilla chips, or sprinkle crushed chips over the top.